Another promising host provider that we are reviewing gives us a glimpse of what they offer from support to seedbox reliability, speed and guaranteed server uptime. UltraSeedbox is one of in-demand seedbox providers we have around. This provider can compete with other providers in terms of services and products offered, especially with seedbox plans. Our review for UltraSeedbox is one of the Super Power 1GBPS Storm seedbox plan with a disk space of 900GB and expected download and upload speed of 1Gbps in an unlimited traffic. Storm plan’s network location is at EvoSwitch, The Netherlands. A speed test was done to make an actual upload and download activity as part of UltraSeedbox’s demonstration on how their seedboxes perform. Rutorrent is the chosen default torrent client used for this test. The speed basically started slow but gradually increased gaining higher traffic. The screenshot below looks like not really satisfying but it gave reassurance that it performed better as trackers were added and leechers and seeders increased. Experience-wise, rutorrent installation does not give a tremendous satisfying speed right after using it for the first time on a new seedbox just like our test seedbox. Speed at almost 12Mb/s within one or two minutes, illustrated below, seems too low due to available peers and seeds. We encourage you to try it yourselves and judge the speed and reliability of UltraSeedbox products. Customer service is another important services that a host provider can give its clients. Feedback and comments regarding how fast and supportive the technical support team affect the saleability of their products and services. UltraSeedbox, from our point of view, tends to be patient with clients’ request. Straightforward and short responses to tickets were good enough to be reliable. The only thing we see that needs improvement is on how quick are they in replying to tickets. It must have been needing more human resources acting as support team in order to answer clients’ inquiries round the clock. UltraSeedbox’s minimalist and simple user interface is impressive. It integrates the torrent client and webUI file folder, including the support and wiki page. Personally, I can say that it’s user-friendly since it’s easy to use. 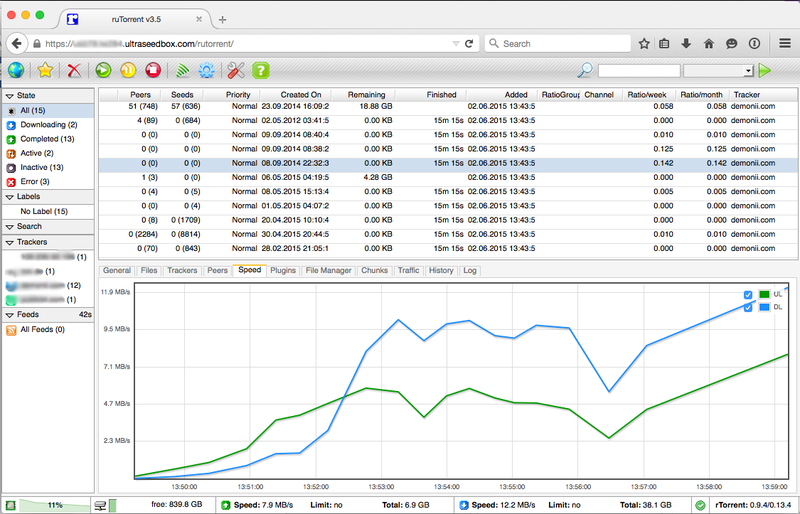 The interface shows the real time traffic and disk usage graphically and a percentage indicator of the activity. Lastly, we can say that they offer one of the best peering activity provided by LeaseWeb located in Europe which assures almost 100% server uptime. LeaseWeb uses latest server technologies that powers UltraSeedbox products and services.